The 42nd running of the Keyworth Quiz ended after 7 weeks, 28 quiz matches and over 1500 questions asked with a very close victory for the South Wolds School Staff in front of a packed audience at the Village Hall. The University of the Third Age (U3A) were the close runners-up but very nearly took the title as they came back from 21 points behind to make the final score 81 to 80. South Wolds Staff were surprise finalists as they had lost in Round 1 of the quiz but came through to Round 2 as the highest scoring runner up and never looked back. The last time the Staff won the quiz was 40 years ago in 1977 when the Quiz was only in its second year. In the first semi-final, the South Wolds Staff had beaten Keyworth Primary and Nursery School 82-58 with a remarkable performance in the bell and buzzer round from team captain Jo Clemmett. In the second semi-final, last year's winners Willow Brook were beaten by the U3A by 54-49. 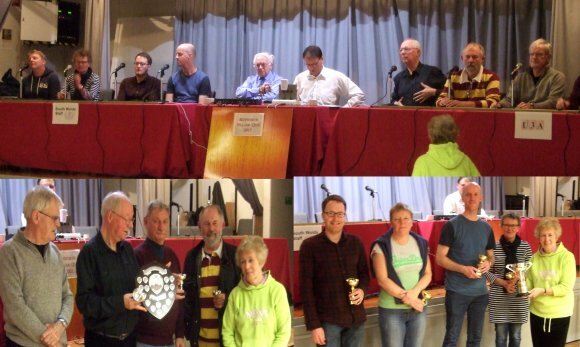 The finals night featured rounds on Nottingham, Dogs and their Owners, Cryptic Song Lyrics, a picture round of mountains and cliffs, a Mastermind round and the usual bell and buzzer questions. Our surprise round this year featured Jim Shaw, Alan Clarke, Angela Harris and Frances Goodman from the Dramatic Society acting out script extracts from famous films for the teams to identify. The Oakley Cup and individual prizes were presented to the teams by long serving scorer Kath Oakley. The quiz organisers Paul Turner and John Spafford thanked the scorers Anne Bellamy and Pat Jackson and technical expert Chris Terrell-Nield. Over £300 has been raised during the Quiz for the charity groups from the village who arrange the refreshments as over 700 people attended the quiz run. Monday 20th March was Quarter Final night at the Quiz. As you would expect the evening lived up to expectations with some of the highest scoring matches so far in the competition. The U3A met BGS in the first match which saw a record total score for 2017 of 118 points with the U3A coming from 28-19 down after round 2 to win by 64-54. Both teams were experts on the round on natural disasters. The second match saw Keyworth Primary School reach their third consecutive semi-final with a 53-38 win. Both teams scored well on Heraldry but came unstuck on the round on islands. The third match was the closest of the night and saw the South Wolds Staff defeat the Methodist Church to whom they had lost in Round 1. The 56-49 win means the highest scoring loser has once again reached the semi-final stage. Current champions Willow Brook School were pleased they had built up a lead of 12 points before the bell and buzzer round as they were beaten 21-17 by the Friends of Kadzinuni on the fastest finger. Their earlier dominance gave them a 52-44 win and put them through to their 5th consecutive semi-final – a remarkable achievement. The semi-final line up for Monday 27th March is South Wolds Staff v Keyworth Primary School and Willow Brook School v U3A. Perhaps we should have expected 4 teams whose remit is learning to have reached this stage and looking at the range of ages of the teams in the last four it is apt that Henry Ford said "Anyone who stops learning is old, whether twenty or eighty. Anyone who keeps learning stays young." Come along to the Village Quiz and stay young! Week 5 was the second of our weeks given over to Second Round matches. Before we could start the second-round proper we had a play-off match between equal second highest scoring losers from the first round, the Scouts Turkey Trotters and the Rugby Club. The play-off took the form of 25 bell and buzzer questions and the Rugby Club triumphed by 24-19 to meet the Scouts Uniformed Branch later. The Guitar Club and BGS had met at this stage in 2016 with the Guitarists winning 55-52. This year BGS took a good lead into the bell and buzzer round and just held on so that the final scores were almost exactly reversed from last year as they won 55-51. The U3A are on good form this year and look like one of the favourites as they beat the strong Parish Church team by 57-42. The U3A and BGS meet in the quarter finals in the match featuring the teams with the smallest names in the competition. The Rugby Club were obviously warmed up after their earlier play-off success and beat the Scouts Uniformed Branch by 60-43 after taking a strong lead in the first two rounds. The final match saw the Methodist Church come from behind to beat the Probus team by 59-45 thanks to their speed in the bell and buzzer round. We have 4 evenly matched quarter final ties in two weeks' time on Monday 20th March starting at 7.30. Week 4 was the first of two weeks featuring Second Round matches and the draw had arranged for each of the four Keyworth schools to be represented in each of the matches. The first match saw the South Wolds Staff in a very close match against the Baptist Church where the staff had to come from behind to win by only 3 points in a very high scoring contest. In the second match, last year's runners up from Keyworth Primary School and the Tennis Club had our first perfect round, scoring a maximum 24 points in a round with questions about people who have given their names to items such as the Bunsen burner or Rubik's cube. The Tennis Club lost 6 points for incorrect answers given when buzzing early so the 54-46 score could have been much closer. Plumtree Cricket Club had a bye in the first round and were unfortunate to then be paired against the champions Willow Brook School. However, an upset appeared to be on the cards as the cricketers led by 9 points going into the bell and buzzer round. Willow Brook's well known speed on the buzzers pulled them through, but only just as the final score was 54-50. Our last match saw Crossdale School trying to achieve a clean sweep of wins for the schools. They failed the examination though and the Friends of Kadzinuni proved too strong winning by 61-46. We completed the First Round matches with good wins for the Baptist Church against the Medical Practice and Probus against new team Inner Wheel. South Wolds Staff lost to the Methodist Church but progress as highest scoring losers with 51 points. The Allotments just missed out on the other highest scoring loser place losing 46-54 against Crossdale School. The Rugby Club and Scouts Turkey Trotters are equal, second highest scoring losers and there will be a play-off between them for the final place. The Second Round matches take place on the 27th February and 6th March, both evenings starting at 7.30pm. The second week of the Quiz had 5 matches including one that was a tie and another with only 1 point between the teams. Our refreshments were provided by Jo Bellamy and her team of helpers from the Keyworth Rainbows. The Labour Party and BGS were tied at 42 all after the bell and buzzer round so the tie break of 5 extra questions came into effect and BGS answered 3 correctly to win by 48 to 44. The two Buttercups training teams were in action on the same night and the first of the teams were unfortunate to come up against last year's runners up from Keyworth Primary School. The school won all the rounds to score a 65 to 24 victory. The entertaining Olde Peculiars Golf Society who have never been beyond Round 1 in the Quiz put in a valiant effort but were beaten on the bell and buzzer round by the Friends of Kadzinuni. Arthritic buzzer fingers and deafness were their excuse – hopefully they will be back next year after undergoing bionic regenerations! Buttercups Training 2 also were unlucky in the draw, coming up against the U3A who posted the highest score so far of 71. The two teams really showed their calibre scoring 47 out of 50 points in the bell and buzzer round, the best in the quiz this year. The final match saw a very tight encounter which was a repeat of the final from 2014 between the Dramatic Society and Willow Brook School. The school hung on to win the tie by 47-46 and the Dramatic Society missed out by one point in being one of the highest placed losers. The quiz now has a break for one week and returns on Monday 20th February with the last of the First Round matches. The Village Quiz started its 42nd season on 30th January in the Village Hall with a bumper crowd of over 100 and some exciting matches. The Quiz was opened by Alan Clarke who has been taking part or helping to organise the quiz since its very early days. He was in the winning Church Mens Fellowship team in the 1980 quiz final and when on the Parish Council he organised the quiz in the 1990s. Thanks to Alan. Our first match saw a high scoring game between the Parish Church, who had 3 new team members, and the Rugby Club. The Parish Church won a close encounter by 54-47 but the Rugby Club will be hoping that their high score of 47 points might get them through as one of the highest scoring losers. The second match was between the Scouts Parents and the Scouts Uniformed Branch with the uniformed team winning all four rounds to comfortably secure their round 2 place. Match 3 was a thrilling encounter between the South Wolds Students and the Guitar Club. A first round on the Human Body saw the Guitar Club take a 14-3 lead but the Students scored maximum points on all their round 2 individual scores to come back to 20-20. They then excelled in the individual round 3 to take the lead 34-24. However, the Guitarists produced a superb encore to take the bell and buzzer round 34-8 to win by 58-42. In the final match our third Scout team of the night the Turkey Trotters were up against the Tennis Club all wearing headbands in celebration of the Australian Open men's final the day before. This was another close match with the Tennis Club edging it 64-47. The Trotters also in with a chance of being one of the highest scoring losers. Thanks to the Scouts for also serving the refreshments. From the start of November the organisers of the 2017 Village Quiz are asking teams to enter the competition. There have been plenty of news events to help Quizmasters John Spafford and Paul Turner come up with entertaining questions for the 2017 Quiz to keep our large audiences amused. For more information, see previous Quiz reports on this site. The Quiz will take place on Monday evenings in the Village Hall from January to March 2017 and is FREE to attend - we usually get an audience of 80-90 each week and over 100 for the final, but can fit more in, so please come along. We will be using the refurbished kitchen to provide refreshments at a small cost served by some of Keyworth's superb community groups to help them raise funds – last year we raised nearly £300. Entry is simple - call Paul on 9147804 or John on 9374833, or send an email to keyworthquiz@hotmail.co.uk. XHTML 1.0 validated. WCAG compliant. Page generated in 0.1519 seconds.